Slimmer Profile – The new model is 37.5% thinner than its predecessor at just 50mm thin. Smaller Bezel – The area surrounding the screen has also been decreased, focusing even more attention on the content. Plug and Play – The easiest way to upload content to a screen thanks to the superfast built in Android Media Player. Simply load content onto a USB stick, insert into the display. Once the files have copied remove the USB stick and images and videos will play in a loop. Commercial Grade Screen – Designed for commercial use and built with high quality components the screen can be used 24/7 and has a lifespan of 50,000 hours. It is designed to resemble a tablet with a tough steel enclosure and tempered glass front. The screen’s LED backlight ensures a bright and clear display. Complimentary Scheduling Software – Scheduling software allows you to take ownership of your display. Choose what is on your screen and when it appears. Internal Locker – Should you need to run the screen from an external source, like a PC, you can do so by using the HDMI or VGA inputs. There is a space to fit a small PC inside the lockable compartment. Power Timer – This allows for reduced power usage by automatically powering off in hours that the display is not required. You can set daily, or weekly, On/Off times for your display. All of these fantastic improvements and features are for the same great price as the 46” model. Without a doubt these are the most attractive and top of the range advertising displays on the market. 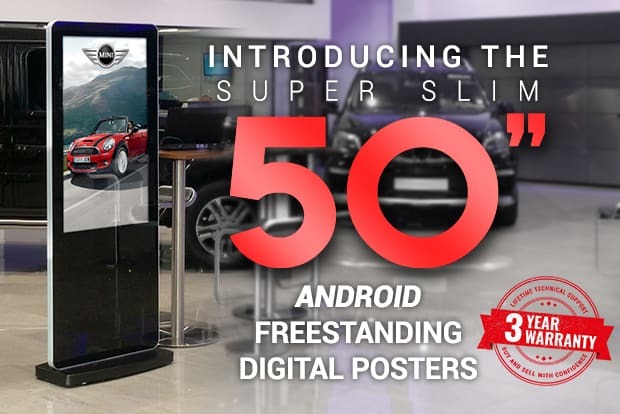 The 50” Android Freestanding Digital Posters are in stock now and available for immediate dispatch.